Somebody is up to something. 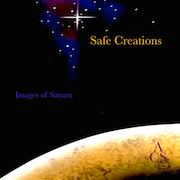 Ken Moore and Dave Vosh, under the name Safe Creations, find a strange sublimity in states of imminent collapse. The album Images of Saturn (52'00") encapsulates their collaboration, bringing into focus the incisive conversation these two artists sustained. This realization is for believers in the beauty of workmanship. With Moore and his gongs, and Vosh and his synthesizers, the duo manipulate mood and atmosphere with hands-on dexterity, and resolutely resist conventional musical narrative. Defying any metaphorical interpretation of their work they seem completely comfortable with the mutual conflict that will inevitably arise between artist and audience. Images of Saturn provides a great many forbidding, fugitive sounds. Its four tracks are each met in the mind of the listener with no frame of reference to anything in the natural world. Penetrating, yet uninflected sonics serve as a reminder of a more complicated existence. Unable to define its shape, we find their arrangements to be surrounding us. Rounded clangorous tones, like messages drifting lost in the darkness of space, seem to unstitch the fabric of reality. Hair raises from the skin as electrical charges build up, and bewilderment becomes the effective state. The seething, writhing, building mass of sound, silver against dusky clouds, creates a spell of slow motion demise. While further in, motionless passages of rumbling bulk lead the mind into a cold quiet. Images of Saturn combines these many sonic figments into dark shadows of their imaginary world counterparts. In time disconnected, an unexpected beauty emerges. With each track roiling in tumultuous ferment along the edge of a cryptic abyss, the listener struggles to find unity and cohesion. Our attempts to impose order on this vast primal world are met with enigmatic counter forces. Yet Images of Saturn remains engaging from beginning to end. This music was not performed, it happened. Past hard to soft dissonance, the receptive mind reaches out to a remote realm - for a warning of the emptiness and desolation that dwells at the edge of humanity.